Where to go – setting up a strategy for the future of STEEM. Test stage 1. This is a real headscratcher since there is no central authority, deciding on behalf of the community. Within the SOS-discord @bigtom13 @bluerobo @imacryptorick @pennsif @rycharde @starkerz @shadowspub and me @traveller7761 have discussed this at length. We have come up with a proposal, which is as decentralised as we can think of. So here it is: a (hopefully) truly community-based road to a joint strategy. 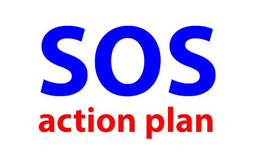 Step 1 is the ideation phase within the SOS-forums. This is used to collect activities. Step 2 is comparing these activities concerning impact and feasibility. This opinion-building will be done via Dpoll – one poll for each activity. Step 3 is discussing the result and developing calls-to-action. This is up to everybody, taking into account the opinion of the community. How will this look like? To give you a picture we have started a first test during the last SOS-forum. @bigtom13 was active as a reporter and collected answers to the question “What would help make more and bigger dapps on Steem?” For the sake of transparency: the question was set up by myself, relying on experience in strategy building and had been presented in the SOS-discord before. Now comes step 2. And this is your step. Please toss your vote on each of the five activities. 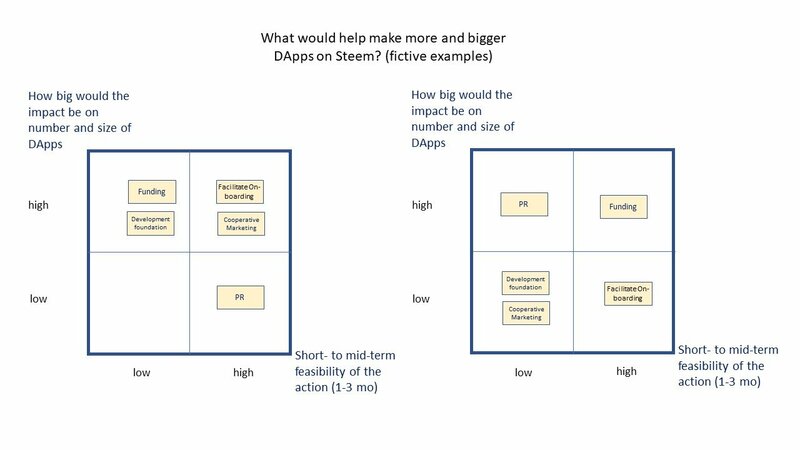 Will the activity have a big or small impact on the number and size of DApps on Steem? How is the feasibility within then next 1 to 3 months? Big or small? test stage 2 – interactive voting during the show. As has been said before - this is a first test on community-based strategy building. So please leave us your questions, comments, critics … whatever helps to make this work really good.